I love to buy from companies that make their own e-liquids. That isn’t to say there’s anything exactly wrong with Chinese e-liquids; there’s a good chance that your first e-cigarette came with a Chinese e-liquid. After a while, though, they all start to taste the same — mostly because the majority come from Dekang, a large e-liquid supplier whose products are resold by vendors around the world. As soon as you taste your first US- or UK-made e-liquid, you begin to realize that Chinese e-liquids actually tend to taste like chemicals, which isn’t what most e-smokers want. I’ve dealt with many different e-liquid suppliers, and these are my favorites. If you are looking for the best e-liquid companies around, give one of these fine folks a try and let me know what you think. In a very short time, Black Note has managed to position itself as the best e-liquid supplier anywhere in the world for fans of true-to-life tobacco flavors. 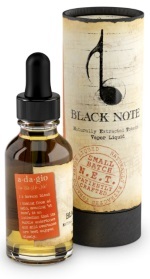 With a production process that begins in Italy, Black Note offers nothing but tobacco flavors along with a single menthol e-liquid. The e-liquids are made using Black Note’s proprietary extraction process that utilizes the leaves of some of the world’s most popular tobacco types including Virgina, Havana and Cavendish. What’s more, Black Note manufactures the world’s first naturally extracted tobacco (NET) e-liquid with full lab certifications. Shipping is always free — even return shipping, if you should decide that you don’t like the product. Can’t decide which flavor to try first? No problem; the Notebook gift box contains large sample bottles of all eight Black Note flavors. As of 2015, Black Note is the best e-liquid company that I am aware of. My favorite of all e-cigarette companies, VaporFi has a constantly rotating selection of the world’s most popular and advanced vaporizers, mods, sub-ohm tanks and rebuildable atomizers. However, that isn’t all VaporFi does — they also make a very popular line of e-liquid called the VaporFi Reserve Collection (Review). The flavors of the Reserve Collection are mild and subtle, optimized for users of high-vapor devices who might be overwhelmed by the strong flavors of other e-liquid brands. In fact, as I update this list of best e-liquid suppliers for 2015, VaporFi is preparing to introduce an even more premium line of e-liquid called the Grand Reserve Collection. You can be certain that it will make a big splash! I’ve been familiar with NJOY for as long as I’ve used e-cigarettes. I never found the company’s e-liquid to be particularly notable, though, until the release of the Artist Collection in 2015. To create the Artist Collection, NJOY reached out to owners of well known vape shops and asked them to design completely new flavors. The result is an absolute treat for those who love sweet e-liquids. In fact, when my initial review sample from NJOY ran out, I immediately purchased new bottles — and I almost never buy sweet e-liquids. My favorite flavor is Sacré Coeur, a blend of berry, rhubarb, custard, almond torte and bourbon flavors. It’s a skillfully blended combination of sweet and savory flavors and I can’t seem to get enough of it. Halo’s selection of e-liquids has an air of exclusivity; not counting Halo’s unflavored base e-liquid, just 15 e-liquid flavors are available in all — and this is a company that’s been around for more than a year. Between the small selection and infrequent releases of new flavors, it feels to me as though Halo doesn’t release a new flavor unless they really think they’ve got something special on their hands. Belgian Cocoa is an absolutely amazing chocolate e-liquid that every e-smoker ought to try, but what Halo primarily focuses on is unique interpretations of tobacco and menthol flavors. Not only do Halo’s products taste nothing like your average run-of-the-mill tobacco and menthol e-liquids, but they also have a mouth feel and vapor production like nothing else I’ve ever tried. Not surprisingly, some of the best e-liquid suppliers are based in the states with the highest tobacco taxes. Near the top of the tobacco taxation list is Hawaii, where Volcano has made its home. Although e-cigarette starter kits are Volcano’s primary business, they have also partnered with a lab in the United States to produce some excellent USA-made e-liquids. If you try nothing else from Volcano, you must pick up a bottle of Menthol Burst; you’ll wonder how any other company could apply the “menthol” moniker to its e-liquids in good conscience. If you like your vapor on the sweeter side, Volcano also has a large selection of e-liquids based on popular tropical fruits such as lychee, coconut and kiwi. Volcano carries 32 flavors in all at the time of writing. Many people decide to switch to e-cigarettes out of a desire to reduce the number of chemicals they ingest, and Virgin Vapor takes that to heart; this is an e-liquid supplier that uses nothing but certified organic flavors and avoids the use of artificial chemicals of any kind. In fact, they don’t even put propylene glycol into their e-liquids unless you request it. Virgin Vapor has around 100 different e-liquid flavors available at the time of writing, and more are being added all the time. Their offerings range from sweet flavors like Kona Velvet Milkshake and Black Cherry Marshmallow to more exotic flavors like Night Blooming Jasmine. Virgin Vapor is also developing a new line of tobacco flavors using organic tobacco extracts. Mister-E-Liquid is a small e-liquid vendor, but definitely one to watch. With nearly 80 flavors available and more being released at a fairly rapid pace, there’s something here for just about everyone. The Ice series — e-liquids combining menthol with various fruits — has proven quite popular, as has Mister-E-Liquid’s selection of interesting and unusual tobacco flavors. Lemon Ice is an e-liquid I’d recommend adding to your first purchase.